1982: The 11 sensei event. As the cultural exchange between Italy and Japan went on, the Kobe Shimbun Group sent a new delegation of Budo (Karatedo, Iaido, Kyudo, Naginata, Shorinji-Kempo) in 1981. 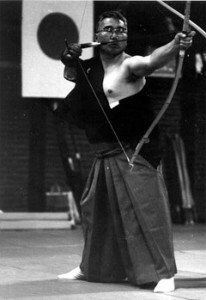 In the meantime, the Kyudo Group comprising the Sensei Osamu Takeuchi and all the other members who had been in Rome in 1979, asked to organize a Memorial Day as they wished to commemorate their deceased friend Yunichi Yamamoto. At the end of the touching event Takeuchi sensei gave Mr. Procesi bows and arrows and the first basic tools in order to encourage the start of the Kyudo practice. The ARK was founded and registered on 21st May 1981. Mr. Placido Procesi was named President and M. Tommaso Betti Brutto, pioneer of Italian Judo, was among the other 7 founding members. The name Mr. Procesi had chosen was intended to prompt the orientation of the future activities: Academy as the place for inner silence, Rome as the centre of Italic classic culture and Kyudo as the way of the Japanese bow. Kyudo, Kendo and Iaido courses were then activated. Thanks to Osamu Takeuchi’s constant attention on the newly founded school, in the following years the Academy was able to enjoy the teaching from Hyogo Federation instructors who were sent to Rome: Sano Shoichi in 1981, a delegation of 11 sensei in 1982 and Tanaka Ryuichi in 1983. At the same time, contacts were being made with other Kyudo realities in Italy and Europe through mutual participations in study seminars: in Inagaki Genshiro sensei’s School ‘Heki Ryu Insai-ha’ in Milan, in Pombia and in Rome. During these meetings similarities and differences between the shamen e shomen styles were pointed out and the groundwork for the future fruitful cooperation was laid. The Academy (ARK) sword group distiguished itself in those years thanks to an intense Kendo activity, participating to numerous meetings and Regional Chanpionships and demonstrations and sustained by Osugi Tadashi’s friendly support. 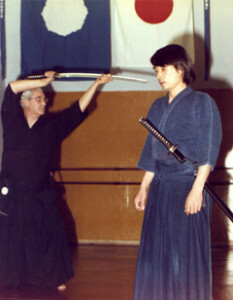 Also the study of Iaido got started following the Musoshinden Ryu style with Hideo Kobayashi. Kumai Kazuhiko with Procesi sensei. In October 1983 at the 5th Italian Fencing Federation gathering, which took place in Selva di Fasano, the Kendo and Iaido learners from ARK approached Kazuhiko Kumai sensei, 7th dan in Iaido, Hoki Ryu. So the following year, a regular course of the study of Hoki Ryu was scheduled and it went on for many years. 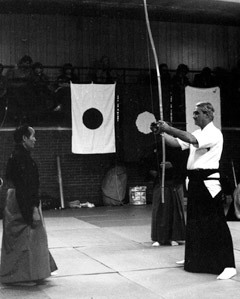 In 1981 Mr, Procesi held a series of conferences on Japanese culture and philosophy where he stressed the inner aspect in the practice of archery and sword held in the Academy. He drew particular attention to the deep kinship with the teachings of Awa sensei, the creator of Daishadokyo (the great way of the Inner Bow) and of Soho Takuan, the great Zen master, in his treatise ‘the unfettered mind’ relating to the art of the sword.